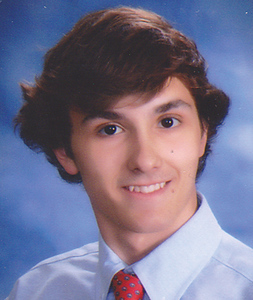 Jesse A. Ziemak, 21, of Stafford Springs, Conn., passed away on Friday, April 5, 2019. He was born in Bristol, Conn., son of Mark and Naomi (Schuler) Ziemak. He was employed by Nature’s Grocer in Tolland, for many years. Jesse was always filled with kindness and willingness to help anyone in need. He was known for his caring, compassionate heart, meaningful hugs and infectious smile. His love of family and friends was truly felt by all who loved him. His kind, gentle heart will be missed beyond measure by everyone he touched in his life. To have been loved by Jesse was a true blessing. Jesse is survived by his loving parents, Mark and Naomi Ziemak; brother, Tyler Rozanski and his wife, Jackie; maternal grandparents, Frederick and Barbara Schuler of Alburg, Vt.; paternal grandparents, Tadeusz and Jadwiga Ziemak of New Britain, Conn.; uncle, Jacek Ziemak and his wife, Danuta; aunt, Dorota Ziemak; aunt, Debra Blanchette and her husband, Kenny; and cousins, Elizabeth, Evan, Sebastian, Peter, Enasia, Enox, Ewelina, Kinga, and Adam. He is also survived by his lifelong friend, Garrett Myers; and Christine DePellegrini, who was like a second mother to him. Calling hours will be held on Friday, April 12, 2019, from 4 – 7 p.m. at Introvigne Funeral Home, Inc., 51 East Main St., Stafford Springs, Conn. A Mass of Christian Burial will be held on Saturday, April 13, 2019, at 10 a.m. at St. Matthew Church, 111 Tolland Green, Tolland, Conn. Burial will be private. Memorial donations may be made to the American Foundation for Suicide Prevention, 120 Wall St., 29th Floor, New York, NY 10005, or www.afsp.org . For online condolences or directions, please visit: www.introvignefuneralhome.com . Posted in New Britain Herald, on Tuesday, 9 April 2019 18:54. Updated: Tuesday, 9 April 2019 18:56.